The mighty Colorado, the West’s most famous river, flows for 1,450 miles through five U.S. and two Mexican states. It begins on the Continental Divide in Colorado’s Rocky Mountain National Park, growing from a cold mountain trout stream into a classic Western waterway and ending just shy of the Gulf of California in Northwest Mexico. Known for its dramatic canyons, whitewater rapids and numerous U.S. national parks, the Colorado River offers an enormous variety of tour opportunities, from hiking and wildlife viewing to boat cruises and rollicking raft rides. Since John Wesley Powell’s epic exploratory voyage in 1869, the lore of the Colorado River has attracted adventure-seekers and other travelers to the West. The National Park Service administers nine parks, recreation areas and monuments along the Colorado River and its key tributaries (Green, Yampa, and Gunnison rivers). They include: Rocky Mountain National Park, Dinosaur National Monument, Curecanti National Recreation Area, Black Canyon of the Gunnison National Park, Canyonlands National Park, Arches National Park, Glen Canyon National Recreation Area, Grand Canyon National Park and Lake Mead National Recreation Area. Potential Colorado River itineraries are numerous and varied, depending on the personal preferences and activity level of the travelers. The following cities are good options for hub-and-spoke tours. Nestled between the red-rock wonders of Arches National Park and incredible sandstone landscapes of Canyonlands National Park, Moab offers endless opportunity for sightseeing and whitewater rafting. Located just outside Moab, Canyonlands National Park preserves 337,598 acres of colorful canyons, mesas, buttes, fins, arches and spires. Four districts are divided by the massive canyons of the Green and Colorado rivers. All districts must be visited separately as no roads or bridges connect them. While the districts share a primitive desert atmos-phere, each retains its own character and offers different opportunities for exploration and adventure, from broad overlooks at Island in the Sky and rambling trails in The Needles to floating the rivers themselves. in the Moab area. Half-day, full-day and multi-day rafting trips are available. 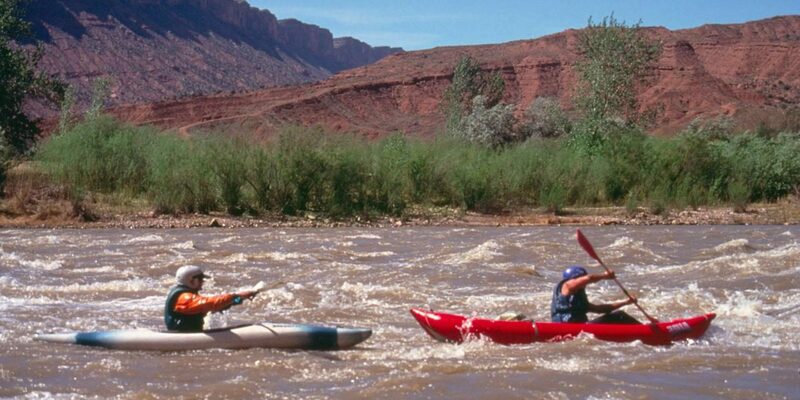 All provide an exciting experience through a wonderful stretch of whitewater and famous red rock canyons. Hummer safaris, jetboat rides, hot air ballooning, scenic flights and zip lining also can be booked in Moab. Since the 1960s, Glen Canyon Dam near Page has flooded the Glen Canyon reach of the river, forming Lake Powell. 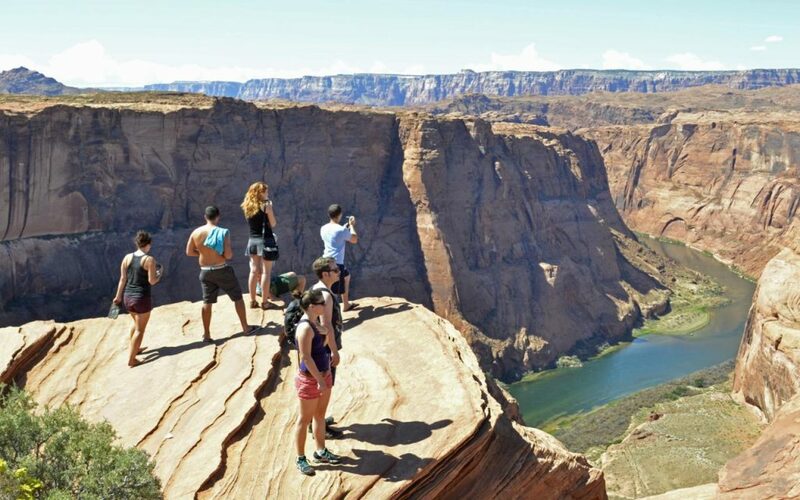 Encompassing over 1.25 million acres and stretching for hundreds of miles from Lees Ferry in Arizona to the Orange Cliffs of southern Utah, Glen Canyon National Recreation Area offers unparalleled opportunities for water-based tour inclusions. Guided boat tours from Wahweap Marina at the Lake Powell Resort are the best way to discover the majesty of Lake Powell while learning about its history and geology. Enjoy a sunset dinner cruise, hear the fascinating story of building the Glen Canyon Dam on a scenic cruise, explore Rainbow Bridge National Monument or discover the wonders of the lake on the “Navajo Tapestry” cruise. The most popular cruise is the “Rainbow Bridge Tour,” which covers 50 miles of the Lake Powell shoreline to Rainbow Bridge National Monument, one of the largest known natural bridges in the world. The bridge rises 290 feet into the sky and 275 feet across Bridge Canyon. View the results of the power of wind and water that formed this remarkable landscape. Note: Due to current projected lake levels, for optimum viewing a walk/hike (1.25 miles) is required to and from Rainbow Bridge National Monument. For groups with not much time to spend on the lake, the “Panoramic Lake Powell Tour” is a good option. Learn about the rich history and geology of the Lake Powell area while viewing the breathtaking scenery of Gunsight Bay and surrounding areas. It’s perfect for taking panoramic photos. Antelope Canyon Navajo Tribal Park, located near Page, is home to one of nature’s most spectacular creations—the slot canyon. Carved from red sandstone by rain and wind, the canyons are narrow passageways that lead several hundred feet away from the mouth. The sloping angles of the rocks, coupled with the shifts of light that make their way down from the rim of the canyon, combine for a scene like no other. Only eight to 12 feet wide along the sandy floor, the slot canyons have been featured in Hollywood films and magazines around the world. Hiking Horse Shoe Bend affords great views of the Colorado River. The trailhead is located just outside of Page. Rugged mountain ranges that change colors with the sunset, majestic desert landscapes and the mighty Colorado River set the stage for year-round outdoor adventure in the Laughlin area. The Colorado River Heritage Greenway Park and Trails project has been named one of the nation’s most promising projects designed to protect special places and recon-nect travelers to the outdoors. The project consists of nine miles of trails for bicyclists, pedestrians and equestrian riders, and includes expansion of the Laughlin Riverwalk. Jetboats travel daily from Laughlin to Lake Havasu City, Arizona (home of the London Bridge) along 58 miles of the Colorado River through beautiful Topock Gorge. Experience the thrill of cruising at speeds of over 40 mph. Or your group can float down the Colorado River on a day trip aboard a motor-assisted raft, with narration by guides who shed light on the history, desert wildlife and beauty of the Black Canyon of the Colorado River. Sights include an up-close view of Hoover Dam, high canyon walls, desert big horn sheep, osprey and great blue herons. The rafts stop along the shore for a box lunch and the opportunity to play in the cool clear waters below Hoover Dam. A tour of Hoover Dam, which forms Lake Mead, the largest reservoir in the continental United States, is also an option. Located 85 miles north of Laughlin, the dam is an integral component for management of the Colorado River, controlling floods and storing water for farms and cities in the lower Colorado River basin. Below the dam the river passes under the Mike O’Callaghan-Pat Tillman Memorial Bridge, which, at nearly 900 feet above the water, is the highest concrete arch bridge in the Western Hemisphere. 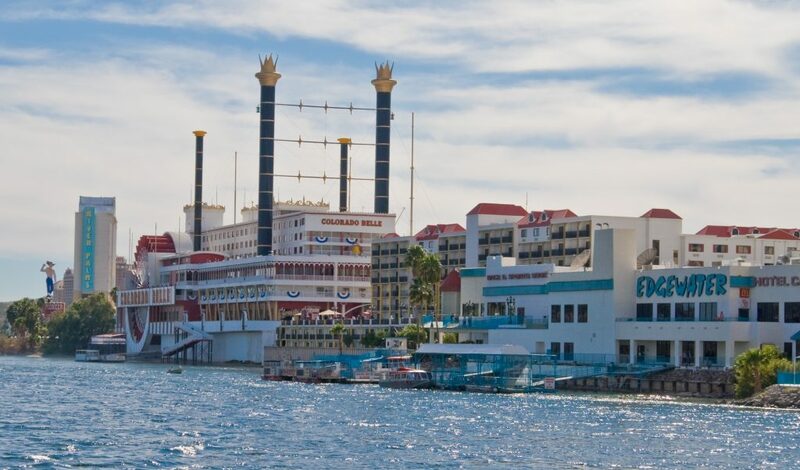 In addition, Laughlin is home to nine casino resorts offering 24-hour gaming, a wide variety of dining options and showrooms featuring top-notch entertainment that you don’t have to spend an arm and a leg to see. 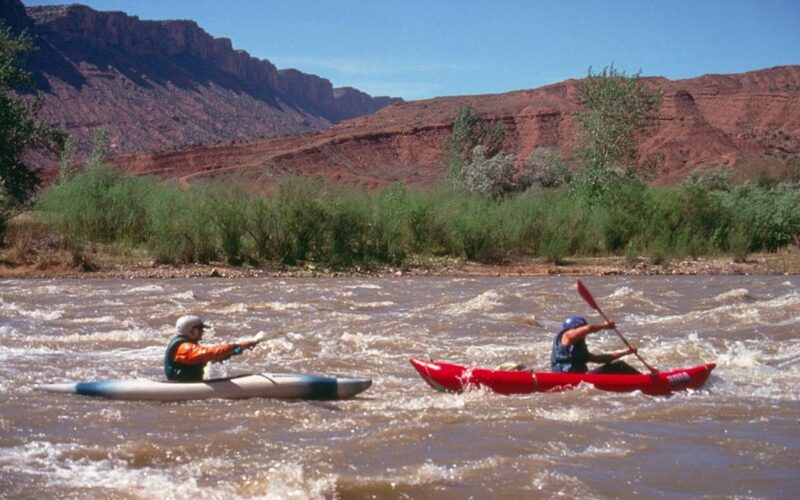 So, wherever your tour along the Colorado River may take you, exciting adventures await.